The Rev Colin Anderson (1937-2011) was Chaplain at the University of Glasgow from 1989 to 1994. Born in Kilmacolm in 1937, he was the youngest of three sons born to David Anderson, Chief Inspector of Schools for the West of Scotland and the Inner and Outer Isles. He was educated at Glasgow Academy, and won a scholarship in Classics to Christ's College, Cambridge. On leaving Cambridge he served in Cyprus for two years as an Education Officer in the 2nd Battalion The Parachute Regiment. This led Anderson to pursue a post-graduate course in Glasgow in Personnel Management. There he met a fellow student Helen Barclay from Kirkcaldy. They both found work in Leeds and while working in an engineering firm in Leeds Anderson decided to change career paths and entered New College Edinburgh to train for the ministry. Majoring in Church History, he pursued studies for a term in Tübingen, Germany, and he and Helen married when he graduated. He earned a master's degree at Union Theological Seminary in New York and his first parish was in Edinburgh, the Old Kirk, in the housing scheme of Pilton. After eight years at Pilton he and his wife and their two sons moved to the West of Scotland when Rev Anderson was appointed Industrial Chaplain to the shipyards of the Lower Clyde. He was closely aligned with the union leaders during the fight to save the shipyards from closure, and took part in television debates on the issue. The campaign won a three-year reprieve for the shipyards of the Lower Clyde. Rev Anderson was then invited to become minister of St Margaret's Parish in Greenock. Having been politicised by the fight to save the shipyards, he was invited by the local Labour Party to stand for election to Strathclyde Regional Council. He won the seat, and his parish comprised half of his ward. 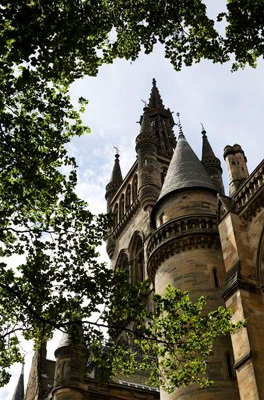 In 1989, Rev Anderson was appointed Chaplain to the University of Glasgow. He took an interest in every Department of the University, and with his wife at the family's house at 11 The Square gave a welcome to students and to staff. After five years in the university he was called to Inverness to be Minister of the Old High linked with St Stephens. After some months in an exchange ministry in Australia, Rev Anderson retired in 2002 and returned to Glasgow. He fulfilled productive year-long locum ministries at Hyndland, High Carntyne, and Glasgow Cathedral. He acted as minister for some months again in the Australian congregation and then was locum minister at St Andrew's Church in Jerusalem.